This renderer does not include code to calculate the crosshair point for the plot. Constructs a new XY clustered bar renderer. Returns a clone of the renderer. Draws the visual representation of a single data item. Tests this renderer for equality with an arbitrary object, returning true if obj is a ClusteredXYBarRenderer with the same settings as this renderer, and false otherwise. Returns the x-value bounds for the specified dataset. Iterates over the items in an IntervalXYDataset to find the range of x-values including the interval OFFSET so that it centers the interval around the start value. Returns the number of passes through the dataset that this renderer requires. Default constructor. Bar margin is set to 0.0.
margin - the percentage amount to trim from the width of each bar. centerBarAtStartValue - if true, bars will be centered on the start of the time period. Returns the number of passes through the dataset that this renderer requires. In this case, two passes are required, the first for drawing the shadows (if visible), and the second for drawing the bars. dataset - the dataset (null not permitted). Draws the visual representation of a single data item. This method is mostly copied from the superclass, the change is that in the calculated space for a singe bar we draw bars for each series next to each other. 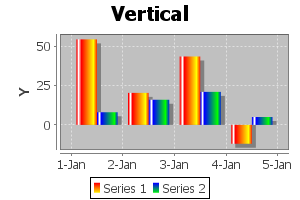 The width of each bar is the available width divided by the number of series. Bars for each series are drawn in order left to right. dataArea - the area within which the plot is being drawn. info - collects information about the drawing. obj - the object (null permitted). java.lang.CloneNotSupportedException - if the renderer cannot be cloned.